The desire to be a mother is an impulse that begins in childhood for most women. But once a spinal cord injury occurs, many women assume having a baby is just not in the cards for them. They are concerned that their bodies can’t handle a pregnancy, or that they can’t be a good parent because they’re in a wheelchair. However, the truth is that women with SCI are able to carry babies to term, and to become incredible mothers. § Having a spinal cord injury does not affect your ability to naturally become pregnant or to carry and deliver a baby. It’s easy for a woman with paralysis to become pregnant. § Women with all levels of injury have had children following an SCI. § Your injury will not impact your baby. Your baby will develop normally, as all babies do. 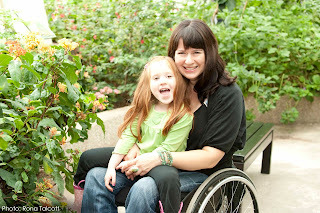 § Mothers with paralysis report that the positive effects of parenting usually outweigh the perceived difficulties. If you’re thinking about getting pregnant, advance planning and preparation will help prevent problems. Consult your doctor to check out all drugs you take, because some medications are harmful to the fetus. It’s wise to get a full gynecological examination before you begin trying to get pregnant. Seek out an OB-GYN in your area who has had experience with mothers with SCI, and make sure your obstetrician consults with your rehab doctor on issues such as autonomic dysreflexia (AD), bowel and bladder management, pressure sores and how your injury will impact your pregnancy, labor and delivery. You also need a urology check-up beforehand, as the growing baby will put pressure on your bladder. Most often, managing a pregnancy of a woman with SCI becomes a team effort among all her doctors and the members of her family. And once a baby is born, parenting becomes a team effort as well.